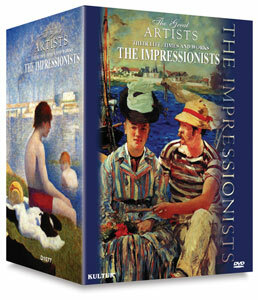 This authoritative and entertaining series from Kultur Films tells the stories of the artists who have captivated and thrilled people around the world for generations. Chronicling the life, times, and works of each featured artist, it explores their stylistic trademarks. The programs place each artist in historical context, highlighting the events that inspired their work and providing a clearer understanding of the creative process. The six programs in this collection provide an in-depth look into the fascinating world of the Impressionists and their art.